Scott Snyder and artist Jock continue this dark tour through Gotham, as Bruce must fight his own inner demons and simultaneously face down the worst versions of himself. Without a true purpose other than continuing to fan any flames left from Dark Knights Metal, this series comes off (at this point) as a mere cash grab rather than a gripping story about the Dark Knight that needed to be told. Filled to the brim with references to Snyder and Jock’s time on Detective Comics as well as the aforementioned Dark Knights Metal, it feels as though Snyder is simply spinning his wheels with this mini series. The Batman Who Laughs’ plans come into form as he sets out to poison Gotham’s water supply, while Batman continues to struggle with the Joker Toxin flowing through his veins. Desperate times call for desperate measures, the madness within drives Bruce to enlist in the help of Commissioner Gordon’s serial killer son James Jr, last seen in the Black Mirror storyline, to aid him in understanding the mentality of a murderer. Answers continue to dwindle away for Bruce and the GCPD while on the tail of the Batman Who Laughs and Grim Knight. The Caped Crusader must find a way to foil their plans any way necessary and embrace his inner demons as he faces down a black mirror of his own. Jock’s art comes off as more so sloppy this issue rather than highly stylized, albeit fitting the aesthetic of the series nonetheless. As the issues continue forward, Jock seems to be rushing through his work; leaving more negative spaces, poor character works and just all around displeasing to follow with this particular chapter. Typically a cover artist, as opposed to interiors on ongoing titles, the heavier workload seems to be waning on the artist as he delivers his weakest DC interiors to date. David Baron makes due with what he is given but the art of Jock leaves little to be desired this time around. On the contrary, Riccardo Federici brings a horrifically beautiful variant B cover for this issue. Snyder seems to be patting himself on the back with this series as a whole. Outside being a variant cover machine, this series truly presents no greater purpose. 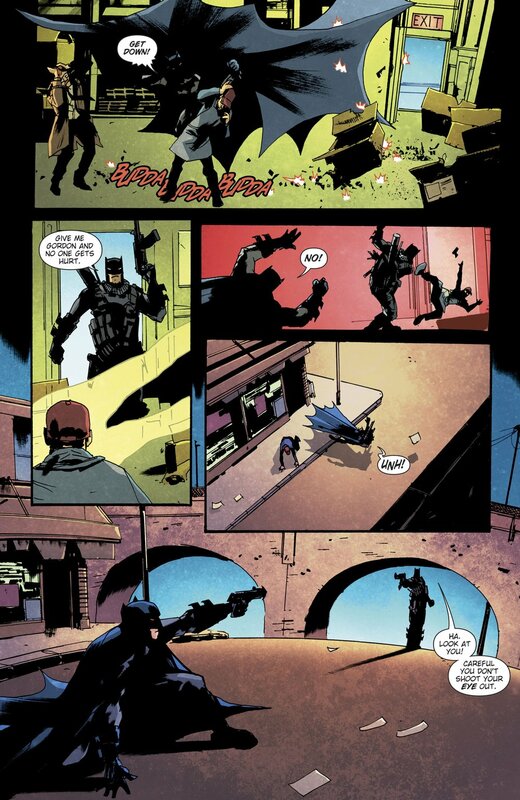 Between the uninspired plans of the Dark Batman planning on poisoning Gotham’s water, while simultaneously displaying Batman complimenting a serial killer on how great him and the Joker think he is, this chapter highlights the ongoing problems with this series and the depth, or lack thereof, for the Batman Who Laughs. With another one shot slated to surround the Grim Knight in the near future, Dark Knights Metal continues to spin out new comics even a year after its finale. Snyder and Jock leave much to be desired as the larger meaning of the series still fails to present itself and accomplishing nothing of higher importance in the process. As it stands the series lacks a an actual purpose outside of cashing in on the hyperbole surrounding the the titular villain and his new sidekick from the Dark Multiverse.